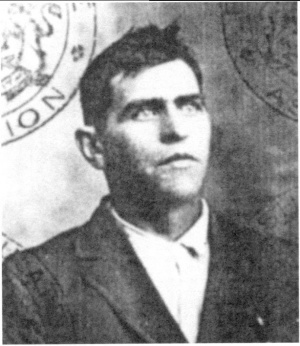 Jakob J. Braun 1929 passport photo. Preservings photo. Jakob J. Braun: farmer; born on 10 January 1887 in Alt-Bergfeld, Manitoba, to Jacob F. and Maria K. Braun. He was the sixth of 11 children in the family. Jakob was baptized in May 1907 into the Chortitzer Mennonite Church in Manitoba, married Katharina K. Falk (1890-1927) on 28 November 1911 and farmed in the Grunthal area. The couple had eight children, two of whom died as infants. Jakob and Katharina were part of the immigration of Chortitzer Mennonites from Manitoba to Paraguay in 1926, where Katharina died on 23 March 1927. The widowed Jakob, together with his children and extended family, returned to Canada on 12 August 1929. He married Maria W. Klassen (1888-1964) on 23 August 1930. Jakob died on 17 October 1950 in Grunthal, Manitoba. GRANDMA (The Genealogical Registry and Database of Mennonite Ancestry) Database, 5.03 ed. Fresno, CA: California Mennonite Historical Society, 2007: #344356. Braun, Ernest. "House of Jacobs 1787-1997." Preservings No. 11 (December 1997): 61-63. Janzen, Jake. “Jakob J. Braun (1887-1950) Passport.” Preservings No. 14 (June 1999): 93. Huebert, Susan. "Braun, Jakob J. (1887-1950)." Global Anabaptist Mennonite Encyclopedia Online. December 2007. Web. 23 Apr 2019. http://gameo.org/index.php?title=Braun,_Jakob_J._(1887-1950)&oldid=94116. Huebert, Susan. (December 2007). Braun, Jakob J. (1887-1950). Global Anabaptist Mennonite Encyclopedia Online. Retrieved 23 April 2019, from http://gameo.org/index.php?title=Braun,_Jakob_J._(1887-1950)&oldid=94116. This page was last modified on 23 August 2013, at 14:27.